Professor Baxi started with talking about the divergence between virtual and physical spaces, the two planes where identities are constructed. The identities are given unique and peculiar shapes on the online sphere of the internet. He said that we live in an era of finished products. The present generation does not take much pleasure in learning, understanding and working with unfinished fragments of things. He said that while a fragment is something less than the whole, a finished product, on the other hand, is complete. He remarked that what fragments offer is at times, more than what finished products can provide us with. He said that fragments offer a better guidance in the form of clues to understand identities. He lamented that in our obsession with finality, we somehow have lost the art of thinking and writing in fragments. He paralleled this conception with the working of a Constitution. He said that a Constitution is never a final document. It is a work in progress, constituted itself by a multitude of fragments. The study of a constitution therefore, must piece together all these fragments and make sense of them. He said that what we study in a Constitution are the elements of annihilation, and elements of development. He noted that the Constitution is but a collection of fragments that must be pieced together through the act of interpretation. The act of interpretation, he said, is as much about creative destruction as it is about creative (or uncreative) construction. He stressed on the need to read the Constitution not just as a text, but as a document of human suffering. The lyrics loosely translate into the message that happiness and sorrows often coexist in this world, a message that is beautifully captured in the metaphor that places where trumpets are heard, are not unknown to wailings and calamities. In Prof. Baxi’s view then, it is imperative to recognize where we see the shehnais and where we see the maatam in our own Constitution. Prof. Baxi then implored the audience to ask what in the Constitution is the trumpet of power and authority, and where in the Constitution do we find the elements of severe grief and calamity. He told the students that they would not have read the Constitution unless they would have asked this question off the text/fragments. He thus remarked that a Constitution has to be read as a social text, i.e., a text of human and social suffering. He left it to the audience to search for themselves the elements of shehnai and the maatam in the Constitution. Prof. Baxi therefore remarked that we must identify the elements of creation and of destruction in the constitutional text. This enquiry lays the groundwork for us to ponder into the questions of constitutionalism and identity. The lecture then delved into the meaning of ‘constitutionalism’ itself, which Prof. Baxi described as majorly, a story of power, governance and resistance to power. He noted that constitutionalism encapsulates the elements of resistance, liberation, degradation and emancipation; and is a moving horizon. He, as an aside, expressed his discomfiture of viewing the world through ‘isms’ (and therefore a concomitant discomfiture with the term ‘constitutionalism’ itself), since ‘isms’ tend to restrict meanings by implying dogma, doctrines or even a way of life, so to speak. A second problem he found with ‘isms’ was that of periodising history, or “putting history into slots”. Drawing inspiration from the works of Karl Marx, who tirelessly brought out the exploitations widespread in capitalist societies, Prof. Baxi asked the students of law to explore how much does the constitutional text tolerates, supports, and reinforces exploitation in Indian society. He said that he has learnt the idea of thinking about the ‘other’ from Marx and avoiding the “tyranny of the singular” and thinking plural, and in that vein, would like to ponder as to what is the other of constitutionalism, wondering whether the antonym of “constitutionalism” is authoritarianism, since authoritarianism itself could also be constitutional. After all, there are constitutional provisions which allow for the imposition of a state of Emergency. He noted that constitutional dictatorships are also possible, although he opined that phrase is an oxymoron. He continued to ask the audience whether the ‘other’ of constitutionalism is dictatorship? or an absence of all restraints on power? In fact, it was noted that this question begs all the more seriousness when one studies the judicial process of the Supreme Court or the High Courts, because there the learned judges are routinely “imposing constraints and purposes on power”, be it through ideas of a ‘public trust’, administrative law, estoppels, and alike ‘normative disciplines on power” to prevent its arbitrary exercise. He however left the understanding of the ‘other’ of constitutionalism (whether Emergency, authoritarianism, dictatorship etc) to the audience. Drawing a historical perspective, Prof. Baxi highlighted that the Athenian Constitutionalism drew a distinction between citizens (those with rights) and slaves (those without rights). According to him, the transition to modern constitution happened when everyone became citizens. He said that in post-modern constitutions, the distinction between slaves and citizens was abolished, and everybody was given equal rights. However, he highlighted the limits of constitutionalism especially in the backdrop of modern-day slavery in the form of human trafficking and farmer suicides, existing simultaneously with the Indian Constitution. This, in his personal view, is a marker of our transition from colonialism to a neo-colonial world (typically characterized by ‘exploitation without redress’ and ‘power without accountability’). He acknowledged that post-modern constitutions like India’s, East Timor’s, South Africa’s and other new-nations’ constitutions, abolished the distinction between slaves and citizens and gave everybody equal rights, but called this promise a ‘fairy tale’ (bringing to light the ongoing slavery, trafficking in human beings, women being bought and sold, child trafficking, farmer suicides; in India in particular, as in other parts of the world). In light of the above neo-colonial realities, Prof. Baxi highlighted that what is normative in the constitutional promise, is not real. We have a reality of slavery, and a normative reality of constitutionalism. An acknowledgment of this dual reality helps us identify the maatam in the constitution. We might therefore be able to draw a neat distinction between modern and pre-modern slavery, but what we would be studying is slavery, not constitutionalism. C3 as the ideology and theory of a constitution, or a philosophy of the constitution. This is where what we loosely refer to as ‘constitutionalism; can fit. He went on to explain that every constitution is as much written as it is unwritten, and the written text (C1) is often at play and at war with what is unwritten. There persists a dilemma between that which is said and that which is left unsaid. The very act of saying something entails the exclusion of what you choose not to say; and thus the unsaid exclusions are the spheres where great battles are fought in the working of the Constitution (and in fact, what is unsaid is often much more than what is said). On C2, he mentioned that while certainly it forms our constitutional law, it is more than that. He propounded the idea that interpretation of the Constitution (C2) must also include ‘citizen interpretation’. It is this part of C2 that sees some citizens activating the judicial process and bringing to us new laws like the RTI, or new laws emerging out of women’s movements, etc. These citizen movements create new norms that are legislated by courts or parliaments. To bring home his point further, he asked the audience to wonder what the American Constitution would be without Martin Luther King Jr., and his ‘I have a Dream’ speech. In a similar analysis for India, he remarked that every activist judge in India is a linear descendant of Jaiprakash Narayan, whether he knows it or not, since he had shaken up the lethargy of the so called Indian democracy (where, according to Prof. Baxi, the term democracy is a misnomer, since what we have is a mere ‘electocracy’). Similarly, it is next to impossible to understand the Indian Constitution without Amnedkar, Gandhi, or Lohia. Other than ‘citizen interpretation’, C2 would also include the interpretation of the Constitution by the legislature and the executive, which is not judicial (proclamations of President’s Rule in Uttarakhand and Arunachal Pradesh being examples on the point). He thus surmised as to how judicial interpretation of the constitutional text is not the only form of interpretation. There are more than mere judicial actors who go on and interpret the constitution, and thus shape and influence its working. They are legislators, executive officers, citizens, civil society and the media. Each one of them gives their due to the constitutional working and thus occupies a significant place in the process. Therefore there are various interpretations of the Constitution and one cannot understand the judicial interpretation without looking at citizen interpretation in its various categories. Now, after setting the ground for his concluding analysis, Prof Baxi referred to Gary Jacobson who expounded upon the concept of a ‘constitutional identity’. Constitutional identity, according to Prof. Baxi, is always in a flux, and cannot be ascertained or ascribed to one ideal. Constitutional identity is not robust, but rather permeable. In this context, he remarked that the Constitution is often what the judges make of it. Judges try to make sense of the text, and thus Charles Hughes’s adage that a “constitution is what the judges say it is”, is nothing but true, at least in the domain of identities shaping constitutional functioning, Further, since this determination (of the what the constitution is) is only possible when the judges declare what the constitution is; we don’t know what it is till the judges tell us so; thus making the meaning of the constitution always operate in a limbo, or in air, and therefore it is up for grabs by the judges, or even the legislature for that matter. He emphasized that it is this nature of determination of what the constitutions says, that makes it stranded up in the air, and up for grabs. 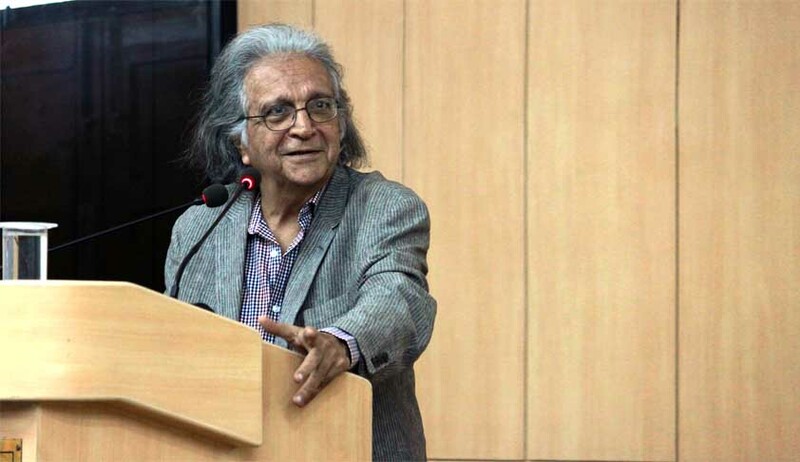 Thus, Prof. Baxi expressed his view that the constitutional identity is not rigid, or set in stone; but contingent, subtle and dependent on the political, social, and economic atmosphere that prevails at a particular time. Referring to Karl Llewellyn, Prof. Baxi reproduced his statement. that “do not look at what the judges say, but look at what they do with what they say”. And since the opinions of our judges are not known until the judgment is pronounced (and it is only then that we get to know what the Constitution says), constitutional identity will always be in a in flux. Professor Baxi thus concluded that there is no identity, but processes and practices of identification (operating in the realm of ‘social identities’) on our own part. It is these practices of identification that the Constitution provides for; and the principle of ‘unity in diversity’ (say, the Uniform Civil Code and other directive principles) as well as ‘unity in perversity’, are ways in which the Constitution provides for the practices of identification. Further he noted that when we talk about the practices of identification, we place a desirable premium on agency of individuals, within structures. Lastly, Professor Baxi addressed another angle to the question of ‘identity’ and observed that identities could either be ascribed or achieved. In the context of affirmative action, he noted that there is a constant need to evaluate which sections of society are identified as ‘weak’ (or the determination of ‘progressively weaker’ sections, which is the term he would prefer), and raised important questions of whether there is a human right to identity, and if yes, whether there is a human right to change that identity, in which context he brought up the Shah Bano decision as an example. "Constitution is what Parliament says it is, what the Supreme Court and other High Courts say it is...it is true. But I think the Constitution is also what you and I wish to say it is. And that's where constitutional identity resides - in what you wish to say, in full responsibility, as to the essence of the constitution...and that is the practice of identification."